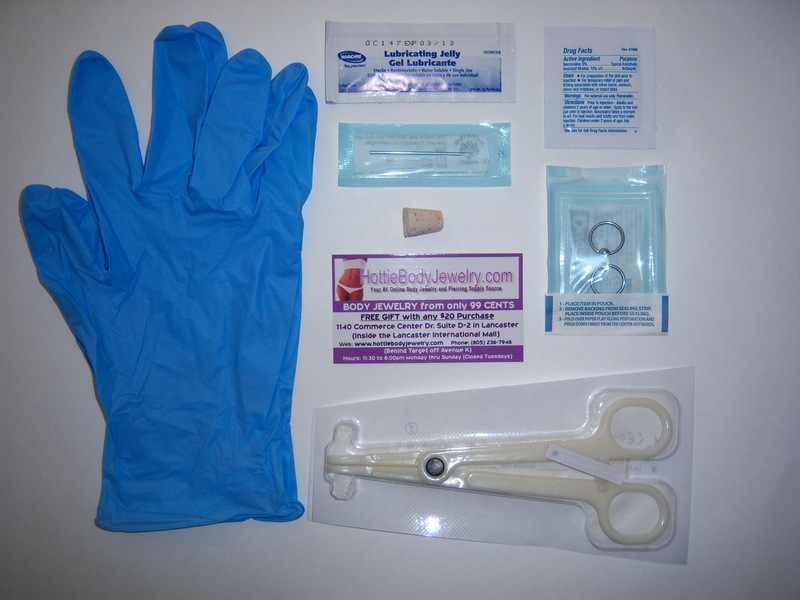 Body piercing kits are available for virtually any kind of body piercing. Although there are a myriad of kits available on the web (through individual web sites or auction sites such as ebay), not all piercing kits are created equal. What separates the good from the bad piercing kits is not so much where you buy them, but what a kit includes. A surprisingly large number of body piercing kits for sale offer the rudimentary needles, tools and prep, but very few actually offer sterile body jewelry. Using sterilized body jewelry for body piercing is required by law, and for good reason; using unsterilized jewelry can lead to serious infection, injury or even death. What good does it do to wear gloves and use a sterile needle to make the piercing, if you are just going to just shove a dirty piece of jewelry into the skin? Other inferior kits may include a few needles and prep items with an ear-piercing gun or similar inappropriate tool for body piercing. These kits are primarily ear-piercing kits that are being incorrectly sold as body piercing kits. Remember, it is more important to read the details of a product than to judge a kit by it’s photo. Many sellers have ‘small print’ that says that what you see may not be what you’ll get. If that’s the case, you can bet that by the time your kit reaches you it will suffer numerous substitutions and degradations in quality. If there is one thing that separates the ‘men from the boys’ in the body piercing kit world, it is sterile body jewelry. Do yourself (or your client) a favor and make sure the body piercing kit you purchase includes sterile body jewelry. If you are unsure if the jewelry in the kit you are interested in, ask the seller directly. You’ll be glad you did!